1 - Straight Right Hand Points ST-240 (168mm lg.). - equivalent Hornby points R613. SCALEWAY OO36L. LEFT HAND POINT KIT PLASTIC 3ft. ITEM UNTOUCHED. Triang Railways - R291 / 293 - Left hand points X156 - Points motor - boxed. The points are marked "Triang" and "R291 / 293" and "Built in Britain in England" on the underside of the base. The fitted electrical motor is marked "Triang" and "X.156" and "Built in Britain" on the underside of the base. 2 x Hornby R8072 Left Hand Points - Nickel Silver - OO Gauge. Condition is Used. Dispatched with Royal Mail 1st Class. 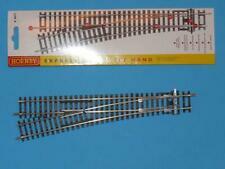 New listingHORNBY OO GAUGE R8072 LEFT HAND POINT..
REST OF THE WORLD £12.70. UNITED KINGDOM £2.00. VERY GOOD CONDITION.WITH ALL RAIL JOINERS. ALSO, IF A BOX IS INCLUDED IT WILL BE SHOWN IN PHOTO. 2 x R612 / 3 x R613 Nickel Silver Left & Right Hand Points for Hornby OO Gauge. Condition is Used. Dispatched with Royal Mail 1st Class. 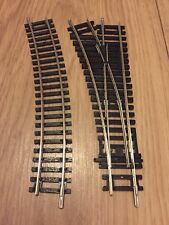 3 X HORNBY LEFT/ RIGHT HAND STANDARD POINTS (OO GAUGE) LOT E12 IN VERY GOOD CONDITION. HORNBY OO GAUGE R8072 LEFT HAND NICKEL SILVER POINT & PECO PL-11 SURFACE MOUNTED POINT MOTORS X 2. REST OF THE WORLD £3.80. UNITED KINGDOM £1.59. Hornby Left-hand Curved Point (R8074). Hornby points are supplied for operation by hand. Detailed scale model designed for adult collectors and is not intended for play. This product is not suitable for children under 36 months as it may have sharp edges and small parts. Graham Farish OO Gauge Super Live Way Points Right Hand, These points are a shorter length than the other sets i have for sale approx. 22 cm long. Points are in mint condition, however i have had to open the boxes to see what hand they are. SL-92 INSULFROG SMALL RADIUS LEFT HAND POINT. Has been on a layout. I will send overseas if required. Hornby OO Gauge left hand express point. Condition is New. Dispatched with Royal Mail 1st Class Large Letter. triang hornby left and right hand points r.490 r491 in original boxes . Condition is Used. Dispatched with Royal Mail 2nd Class. 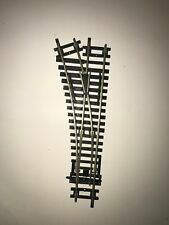 Hornby, OO-Gauge Nickel silver rails. Specific Condition Classifications provided below for further definitions No one likes to be left in the dark. We will be patient and helpful. MINT - item in perfect condition.